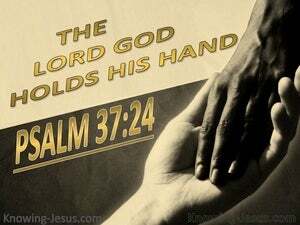 ﻿ Psalm 37:24 When he falls, he will not be hurled headlong, Because the LORD is the One who holds his hand. 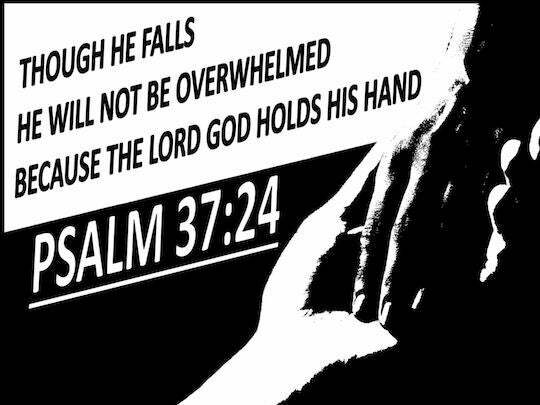 Though he falls, he will not be overwhelmed, because the Lord holds his hand. Though he stumbles, he will not fall down flat, for the LORD will hold up his hand. Though he fall, he shall not be utterly cast down, for LORD upholds him with his hand. Though he fall, he shall not be utterly cast down; For Jehovah upholdeth him with his hand. Even if he has a fall he will not be without help: for the hand of the Lord is supporting him. though he fall, he shall not be utterly cast down, for Jehovah upholdeth his hand. Though he falls, he shall not be utterly cast down, for the LORD upholds him with his hand. If he shall fall he shall not be prostrated, for Jehovah will uphold his hand. Though he falls, he shall not be utterly cast down: for the LORD upholds him with his hand. Though he fall, he will not be cast headlong, for Yahweh supports [him with] his hand. Though he fall, he shall not be cast down; for Jehovah upholds his hand. Though he fall, he shall not be hurt, for the LORD upholdeth him with his hand. Even if he trips, he will not fall headlong, for the Lord holds his hand. Though he stumble, he shall not fall, for the LORD holds him up with his hand. Though he fall, he shall not be hurled headlong, For, Yahweh, is holding his hand. Though he should fall, he shall not be utterly cast down: for the LORD upholdeth him with his hand. 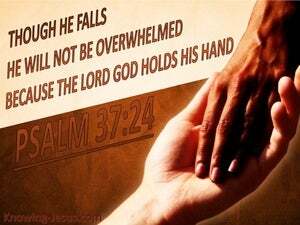 Though he stumble, he shall not fall, for Yahweh holds him up with his hand. When he falleth, he is not cast down, For Jehovah is sustaining his hand. 23 The steps of a man are established by the LORD, And He delights in his way. 24 When he falls, he will not be hurled headlong, Because the LORD is the One who holds his hand. 25 I have been young and now I am old, Yet I have not seen the righteous forsaken Or his descendants begging bread. The LORD sustains all who fall And raises up all who are bowed down. If I should say, "My foot has slipped," Your lovingkindness, O LORD, will hold me up. But as for me, I will watch expectantly for the LORD; I will wait for the God of my salvation My God will hear me. The LORD supports the afflicted; He brings down the wicked to the ground. But Peter said, "Man, I do not know what you are talking about." Immediately, while he was still speaking, a rooster crowed.